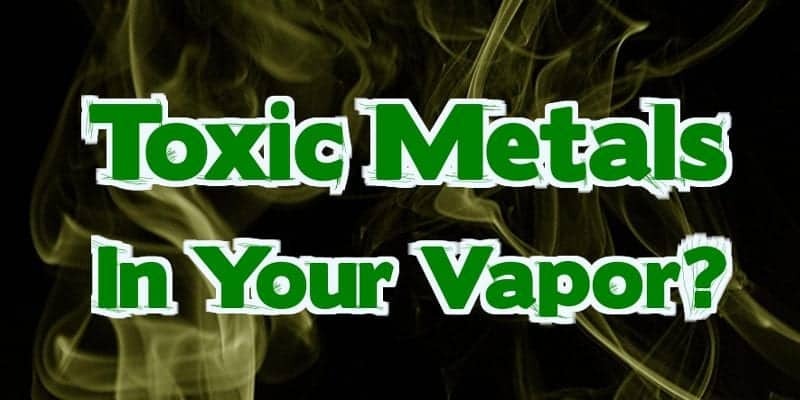 Home → Vaping Info → Toxic Metals in E-Cigarette Vapor? Toxic Metals in E-Cigarette Vapor? Recently there have been reports about a new study showing that e-cigarette vapor contains toxic metals. Several news outlets have reported this, and they all appear to be basing their information entirely on one source: the official press release from the institution where the study was conducted, the University of Southern California (USC). The study compared the chemical content of vapor from e-cigarettes to that of smoke from traditional cigarettes, according to USC. Their study revealed that while very high amounts of cancer-causing hydrocarbons were detected in cigarette smoke, the levels of these substances were ‘reduced to almost zero’ in vapor. This sounds bad… Should we be concerned? One of the study’s authors, Dr. Constantinos Sioutas, says that while the presence of these metals does raise concerns, overall their study shows that e-cigarettes are safer than smoking. The study’s lead author, Ph.D. student Arian Saffari, said, ‘The metal particles likely come from the cartridge of the e-cigarette devices themselves, which opens up the possibility that better manufacturing standards for the devices could reduce the quantity of metals in the smoke.’ Only one model of e-cigarette was tested, the Elips Serie C.
All of the experiments were conducted ‘in offices and rooms’ to better mimic real-world conditions. Researchers collected air particles from the room while volunteers were smoking or vaping within. It is unclear whether or not smoking and vaping were tested in the same rooms. I find it very strange that silver is being noted in the abstract, twice, while chromium is completely left out. Ok… So what does the study actually show? I was not able to obtain the full text of this study. However, the abstract includes a full data sheet attached. Luckily for us, the data sheet tells us everything we need to know. The data sheet includes all results from tests done on e-cigarette vapor, cigarette smoke, and outdoor air. The fact that outdoor air was even tested was omitted from both the abstract and the press release. This is curious considering that the findings from outdoor air make e-cigarettes look extremely safe by comparison. The metals cited as a concern in either the abstract or the press release are nickel, chromium, zinc, lead, and silver. Below is a quick breakdown of the specific findings of each of these metals. Chromium: Levels were 4 times higher in vapor than smoke, yet still less than in outdoor air. Zinc: Levels were slightly higher than in outdoor air, yet much lower than in smoke. Silver: Vapor and smoke yielded almost identical levels, yet much less than in outdoor air. Lead: Levels in vapor were lower than in outdoor air, and much less than in smoke. Essentially, the researchers seemed to raise concern over slight differences that are so small they might just disappear if the experiment were repeated. From what I can see, silver and lead are not a concern at all in vapor. It is odd that nickel and zinc were detected at higher levels than outdoor air, yet again, the differences were very slight. The only real anomaly is the issue of chromium. So why are we seeing results like this? The researchers state that the increased emissions of these metals may be due to the way the vaporizer is designed. It is indeed possible that this is the case. Atomizers are made of metal alloys after all, and could lead to some emissions. However, as I said earlier, chromium is the only metal whose result is high enough to be notable in vapor. If the increased levels were due to the metals present in the atomizer or other parts of the e-cigarette, we should see clearly elevated levels of other metals. Yet, we do not. We must, then, entertain other possible reasons for the increased chromium found in vapor. Since there is still more chromium detected in outdoor air, it is possible that the e-cigarette was contaminated. If this were the case, however, levels of other metals would also be very similar to that detected in outdoor air. In the end, the best explanation for this is factory contamination. Since they only tested one model of e-cigarette, they have nothing to compare it to (except perhaps another identical model), so it is quite possible that the excess chromium came from the facility that produced that particular e-cigarette. For starters, it is blatantly irresponsible for the university to issue this press release claiming that both nickel and chromium were present at levels 4 times higher in vapor than in cigarette smoke, when in reality only chromium was found at such levels. This, along with the convenient omission of data collected on outdoor air, has lead to a whole host of misinformation being perpetuated in the media. When the data are examined independently, they show very little reason to be concerned about e-cigarette vapor emissions. In fact, this study shows very clearly that vaping is a much safer alternative to smoking cigarettes. Furthermore, it must be noted that the levels of all metals detected in vapor over which the researchers expressed concern are over a thousand times less than the OSHA permissible exposure limits for these metals. In other words, the levels they found are considered extremely safe. In this article, James Dunworth interviews Dr. Riccardo Pilosa, a world-renowned expert in tobacco addiction. 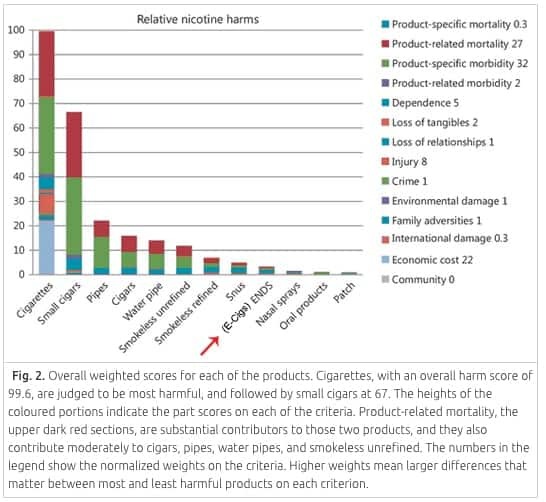 A graph is included (see below) which compares the risks of a number of nicotine products. When tobacco cigarettes are ranked at 100, e-cigarettes are ranked at only 4. In the end, this study should leave you with nothing to worry about at all. great article..interesting to say the last thans for posting it and your site ! love it and the giveaways! 🙂 much appreciation here! You are very welcome 🙂 thank you for reading! Chromium and nickel are coming for the wire coil.. nothing else, no where. well. possibly the tank i guess but that would be so microscopic i doubt it could be measured properly. why oh why do these studies ALWAYS test crappy chinese hardware and crappy chinese juices. – i mean for the love of god, test some real hardware and organic juices. What DOESN’T get reported is that while some chemicals may indeed be present, Vapor STILL usually contains them in quantities FAR lower than cigarette smoke. thanks for sharing the info. great article! have had some questions that needed answered and found them all here. love this site! You’re very welcome 🙂 glad I could help! I build my own coils and always torch them on my mod before I wick. I first time I did this, I had my nose right above the kanthal coil and for the first 2 or 3 seconds after you hit the fire button there is a nasty horrid smell, I believe it is the outer coating of the wire. After that there is no smell what so ever. Always torch your coils before wicking! It seems like a massive oversight to have not included a control indoor group of households without vaping or smoking occurring. Perhaps it was convenient to structure the “research” this way…. I can’t take the nickel or chromium data seriously without such a control group, especially in lieu of the relative outdoor air measurements taken. Love your articles Christina. Very informative and well written! Say….are these the same scientists who brought us global warming? We need a new article written based on the new evidence from Johns Hopkins please! They’re quoting arsenic now as being found. The study was done a couple of days so Feb. 22, 2018.